It was a small and informal gathering on New Years Eve at the home of a friend we’ll call Teri as that’s her name. Teri is an uncommon person, filled to the brim with inner peace. In the hope that some of it might spill over, I always try to sit next to her. We dined on roasted turkey and grilled salmon with a blackberry and ginger sauce. We wined and clicked champagne glasses a few times. Three dogs played around the room. Most of us were all of an age where our children have grown and gone. Dogs stick around. Teri looked stunning. One guest presented her with a scarf which she tied on and wore with aplomb. Next she came out with a beautifully proportioned chocolate hazelnut torte atop a vintage glass cake stand. I noted how much more exquisite baked goods look with a little elevation. Something that bakeries have known for ages, and we have only just now adopted. With a couple hours still to go to midnight, our hostess was trying to keep the party going. She suggested we share our resolutions for the new year, and since no one spoke up, Teri began. Glasses were filled once again, and we were all seated around the living room and around the storyteller. She began. Her story climbed like a trek with windings, switches, and sidetracks, and then unfolded, articulating a new years resolution that brought silence to the room. Her story was of elephants and I will do my best to retell. Many years ago Teri felt the urge to go to Nepal, alone, and signed up for an eco tour. The group would study the Gangetic river dolphin in the remote western region of Nepal. Requiring deep pools of water, the dolphin were endangered by plans to build a dam. But before departing on the expedition, Teri discovered a lump in her breast. Suddenly it was time to operate. The Nepal trip was only two weeks out, and Teri held onto it. In the process, “I became known as the woman going to Nepal, rather than a woman with breast cancer.” She readied herself with packing, got all the required immunizations, and put everything in order in hope that she could go. Most remarkably, she determined that anyone signed up for an eco tour such as this would be either a naturalist or a biologist, and in all likelihood she would find someone to help administer her follow up care. Indeed, her tent mate in Nepal turned out to be an oncology nurse. From camp, they rode elephants into the jungle. Passengers sat facing out, two riders per elephant, with one driver behind the elephant’s head directing him with a stick. There was no road, no path, just into the jungle they stepped. But then one of the passengers dropped a lens cover, and by giving a different type of poke the guide somehow communicated the problem to the elephant. As gentle as can be, the elephant fished around the ground with his trunk, found the lens cap, picked it up and handed it the guide. From that moment on, Teri had a new respect for the massive beast. Out of the jungle and down by the river, the elephants demonstrated a playful, gentle, side. The trek continued peacefully following a path alongside the river. At night in the camp while sleeping in her hut, Teri drew comfort from the sound of elephants trumpeting in the distance. Such was her elephant experience, then came her recent dream. However everything was not alright. “I had to send them off to the butcher,” was the reply.” The butcher! Teri shuddered and explained her dream as if just awakening, right there on her living room sofa on New Years Eve. Then she asked if anyone else would care to share their resolution, and the room was silent. We all knew what we had to do: tend to our elephants too. yep time to tend the elephants! You know here in Maine we just received a pair of elephants. They aren’t far from us and the local people have really gotten into having them around. 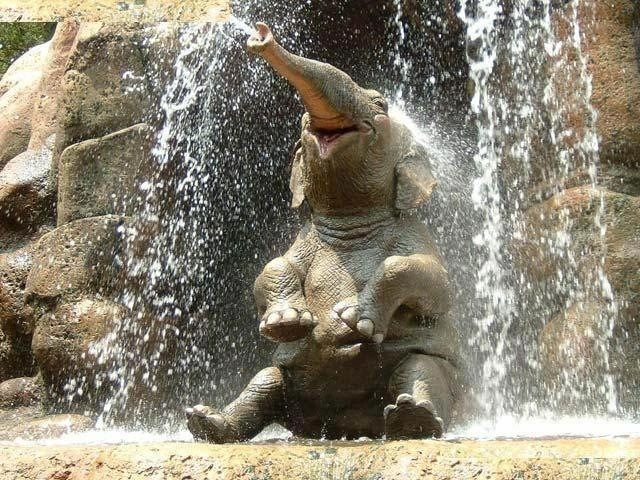 Elephants are amazing creatures. Elephants keep popping up this year for me, strange! Our closest friend out here is a cardiologist and she collects elephants, swears they got her through med school! Our Denver zoo opened up a new seven acre exhibit just for the elephants! It is incredible, they previously had a small plot- maybe half a football field! One elephant had lived in it for 23 years, knew nothing different! On moving the elephants they did so by given them a month before they let in guest! You can go and see smiles on all the elephants faces. My elephants are small, but just as powerful, and gental and scary and wonderious, they are 7 & 8! Most elephants always seem like they have smiles on thier faces, they can carry a tree truck or pick up a blade of grass but the heaviest load they maybe carry is the one that says they never forget. Wow. I’m not sure which impressed me more, her resolution or your recounting of it! A lovely story presenting a good,,sensual, visual with a warm and cozy setting, a subtle taste of roasted meats with a blackberry, ginger sauce and the faint whiff of hazelnuts. Teri almost appears before my eyes with her scarf aplombed, on an elephant near the jungle, all proportioned atop an antique crystal cake stand. The English teacher is out in me on this one and so I have some suggestions which you might consider, or not. By no means are they intended to cramp your style or your flow of writing (cramp and flow are most likely a poor choice of words) for your blog. I like your use of short declaratives, “Dogs stick around.” “Teri looked stunning.” “She Began.” Most effective. Might I suggest lengthening the other sentences in some of those paragraphs by combing some sentences into more compound complex varieties. It adds to the effect of the declaratives if that’s what you want to do. “We had dined… We had wined, and clicked…” Your mix of tenses and the comma are an unfamiliar construction and perhaps confuse my full understanding of the nature of blog writing. “grown and gone” is a great combination especially when applied to children. I would file this one for later use in other, somewhat less expected situations. Mislead in order to lead. The word, got, sends up a red flag for me and I usually come back to it for a better word. Do bloggers edit before sending? Should they? “They all took elephant rides to the jungle.” Sounds a bit like a carnival ride rather than the more serious, they rode elephants into the jungle. I particularly like, “I became known as the woman….rather than the woman….” I don’t really think the next sentence about being healthy is necessary. As a reader, I discovered that myself but having you explain it to me took some of the maturity out of my own discovery. Your story draws me in beautifully and ends with equal perfection. One more sentence, one more thought would have been too much. Your first commentor, margot starts out with a great word, one of the famous words of the famous, Will Rogers, “yep,” spoken nearly in two syllables. thank you, alex. i can always use an english teacher and have made some of your changes.